The Michael Schumacher juggernaut was unstoppable in the first part of the 2000s, but it was brought to a halt by Spain's first world champion in 2005. After being groomed for greatness by Flavio Briatore, he took his maiden pole and victory in his first year as a Renault race driver in 2003. 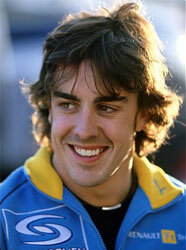 When the team hit the jackpot with its 2005 and 2006 cars, it was Alonso who seized the initiative to take two titles. Despite the unquestionable determination and pure speed, Alonso is far from perfect - witness an explosive season on and off the track at McLaren in 2007. But after returning to an ailing Renault team he had them back to winning ways by the end of 2008. His last season with the French squad was a write-off due to a dud car, but Ferrari beckons for 2010. Should Fernando Alonso be higher or lower in F1's greatest drivers?